The news sounds familiar: a virus with no treatment or cure is spreading abroad. But while Ebola dominated the infectious disease news over the last year, the latest infection making headlines is the Middle East respiratory syndrome (MERS), which has most recently hit South Korea, infecting 87 there and killing 6. Could the two viruses cause similar damage? Currently, MERS doesn’t appear to be able to spread like Ebola can. Though it’s in the same family of viruses as SARS and the common cold—both highly contagious—MERS appears to be less transmittable. While Ebola spreads through direct contact with the bodily fluids of an infected person, MERS doesn’t spread easily from person to person, and though it spreads through the respiratory tract, very close contact is needed, which is why the risk is higher for health care workers. Both diseases have high fatality rates (around 3 to 4 of every 10 patients reported with MERS have died) and like Ebola, there is no vaccine or cure for MERS. But right now, MERS is more of a mystery to the medical community. “Ebola has been around for 40 years so we have a pretty good sense of how it functions and its genome has been pretty stable,” says Dr. Tom Frieden, director of the U.S. Centers for Disease Control and Prevention (CDC). “MERS emerged in 2012 and we are still learning about it, and it may still be learning about us and evolving. It’s believed that when SARS spent more time circulating among humans, it evolved and became more transmissible.” Frieden says they haven’t yet seen that in MERS, but they’re watching: the CDC is currently sequencing the genome of the virus to understand how it might be changing, and to track its course. The chance that MERS could change to become more transmittable worries experts. “Personally, I am more concerned about MERS following the course of SARS than I ever will be regarding Ebola becoming widespread outside of certain regions of Africa,” says Dr. Amesh Adalja, a senior associate at the Center for Health Security at the University of Pittsburgh. In May of 2014, the U.S. experienced two cases of MERS. In both instances, the patients were health care providers who lived and worked in the Middle East. Health departments around the U.S. have the ability to test for the virus, and the U.S. has already tested around 550 people in 45 states as a precaution since the disease first emerged in 2012. 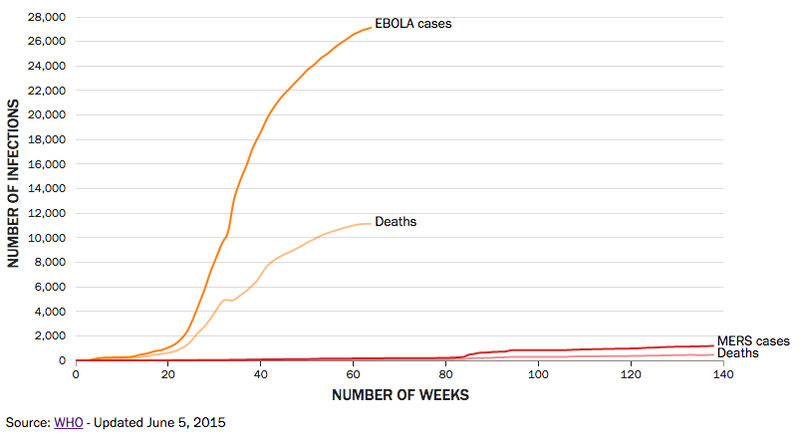 MERS and Ebola share an important similarity: a lack of treatments or vaccinations. There’s currently no vaccine. “If there were a vaccine, it’s the kind of thing that might be useful in the camel population, but that’s very theoretical for the future,” Frieden says. Only 20% of countries are currently able to rapidly detect, respond to or prevent global health threats from emerging infections, like MERS and Ebola, according to CDC data. Countries around the world and official health emergency responders like the World Health Organization have vowed to increase their ability to act during outbreaks that public health experts say are undeniably in our future. Frieden says the CDC in partnership with other countries is accelerating its Global Health Security program, which will increase preparedness worldwide. The CDC is making visits to eight countries in the next six weeks to move the program forward. Dr. Bruce Ribner, Medical director of Emory University Hospital's Serious Communicable Disease Unit in Atlanta where he treated U.S. Ebola patients. Nov. 20th 2014. Nurse Kaci Hickox photographed outside her relatives home Freeport Maine. Nov. 16, 2014. Hickox was quarantined in New Jersey after treating Ebola victims in Sierra Leone. Professor Thomas W. Geisbert at his Lab at the the University of Texas Medical Branch in Galveston. Dec. 2, 2014. Geisbert is a virologist who conducted the first Trials of the Drug TKM-EBOLA. Dr. Pardis Sabeti photographed in her lab at the Broad Institute in Cambridge. Nov. 26, 2014. Dr. Sabeti sequenced the Ebola Genome from this outbreak. Prof. Peter Piot photographed in a lab at the London School of Hygiene and Tropical Medicine. Nov. 12, 2014. He discovered the Ebola virus in 1976.